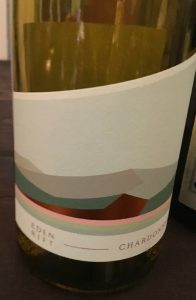 2016 Eden Rift, Chardonnay, Terraces Estate, Cienega Valley AVA, California. Just down the road from the famous Calera and Mount Halan, Eden Rift is a new premium estate winery in the Cienega Valley, near the town of Hollister with unique terroir and soil conditions with this estate series Chardonnay coming from a terraced vineyard site that faces east on rocky calcareous soils. This property was one of California’s first wine estates, being founded and planted back in 1849 and has been cultivating wine grapes continuously ever since. Eden Rift is a new name for this estate, it was known as Pietra Santa until a new family purchased the property a few years back, sitting on the famous San Andreas Fault, it’s in a remote area, feeling a cool breeze from the pacific and located under the shadow of the Gavilan Mountain Range, which helps this warm terroir keep a sense of balance in the wines. This winery has the potential to be something great and I really enjoyed this 2016 Terraces Estate Series Chardonnay, and I cannot wait to try the 2017 and 2018 vintages as they are looking like sublime years in terms of quality a major step up from the drought affected years of 2013 to 2016, I have the feeling after trying a few wines from Eden Rift the future looks extremely promising. That said, in a blind tasting of bUrgundy wines, this 2016 Terraces was a ringer that I had down as maybe an old vine Sant Veran or something close with a nice sense of balance, they made it from their Block T and it sits at about 1,500 feet up, this elevation helps this Chardonnay not get over heated or flabby and has an extended hang time for good flavor development. It was mostly native yeast ferment, coming at about 80% Indigenous and with about 20% using Montrachet yeasts, which add a reductive note, and it was all barrel fermented with 100% malo and 25% new, all French oak. The winemaking team whole cluster pressed the Terraces Chardonnay and the let it settle cold for 24 hours before racking to barrel where it spent about 15 months aging sur lie before bottling in January of 2018. It’s medium/full is weight and has lots of extract and acidity to remain vibrant showing peach, apple and pear fruits at its core along with some lemon, honeysuckle and golden fig adding complexity along with a hint of clove and vanilla spiciness all in a polished fashion, not too oaky or buttery, but rather generous in mouth feel. With air this lightly golden/yellow Chardonnay adds hint of mandarin orange, honey/bee’s wax and nice chalky note, it was composed of four barrels only with two clones, 42% Chardonnay clone 4 and the rest clone 76 and came in at 14.2% alcohol that is really the only tell tale hint that it was from the new world, otherwise this is very traditional in style with a subtle richness, and it’s drinking quite impressively right now, and while a touch pricy, it is quality stuff and with only 100 cases out there it is worth a look.